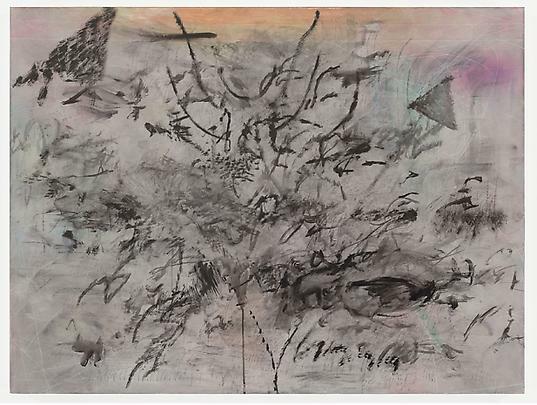 Marian Goodman Gallery is very pleased to present our first major solo exhibition by Julie Mehretu. 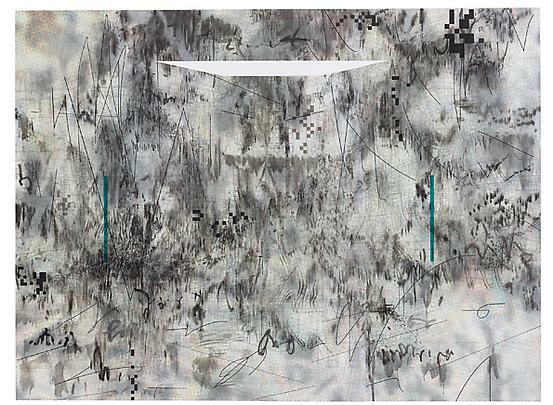 LIMINAL SQUARED will be the inaugural exhibition of Julie Mehretu’s work in our New York space. The show will open on May 11th and continue through June 22, 2013. 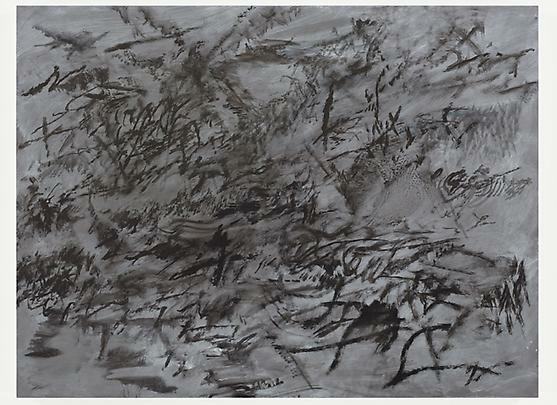 A series of new paintings will be on view as well as a suite of five new etchings. The works were created over the past three years in New York in the aftermath of events of the Arab Spring which were the point of departure for the monumentally scaled MOGAMMA (In Four Parts), 2012, recently presented at Documenta (13), 2012, Kassel. 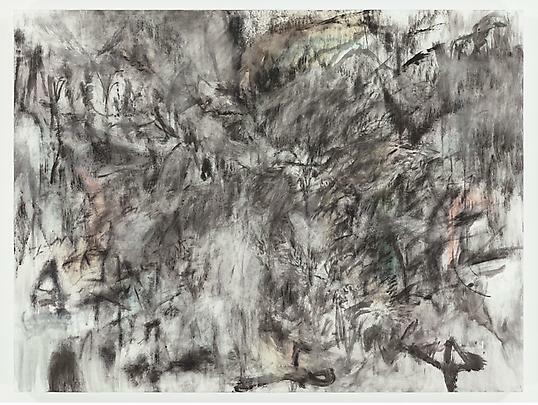 They follow a group exhibition “In Praise of Doubt” at Punta dell Dogana, Venice in 2011; and a recent presentation of her Mind Breath and Beat Drawings at our Paris space in January-March 2013. 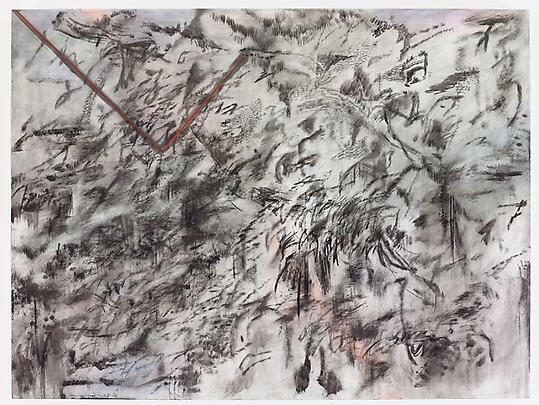 Her meditation on subject matter, whether a spontaneous uprising in a revolutionary square, an algorithm of behavior of the everyday workplace, or post-human culture as it mutates towards the machine, is mirrored in a complex and personal lexicon of painting, a uniquely individual language that ruminates, in a mimetic way, on the swarming, morphing cosmology that is our historical moment, ever persistent in its process of becoming, ever mutating on a precipice of change. It is in this space of the liminal – literally, threshold – the stage of standing on the verge between one’s previous way of structuring identity, time, or community and a new way-- that her new body of work has developed. In the new works, one witnesses the exploration of a new language of abstraction, embracing entropy, resistance, and the imperatives of social agency as they coalesce towards the inchoate nexus of collective history. 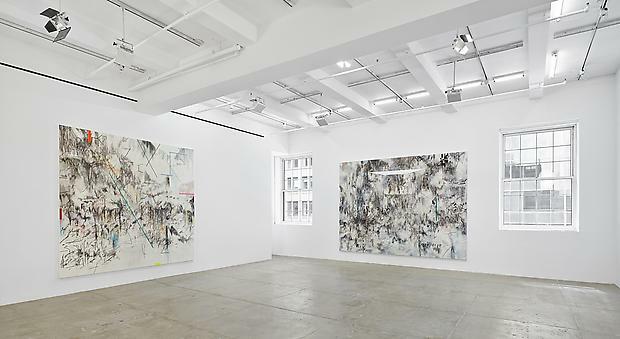 As TJ Demos writes in a forthcoming essay, “Painting and Uprising: Julie Mehretu’s Third Space”, “The paintings’ system of architectural drawings, the various marks and vectors, in this sense, don’t map out a single space, geopolitical context, revolutionary history, or continuous surface, and they don’t propose an image of a coherent spatiotemporal location. 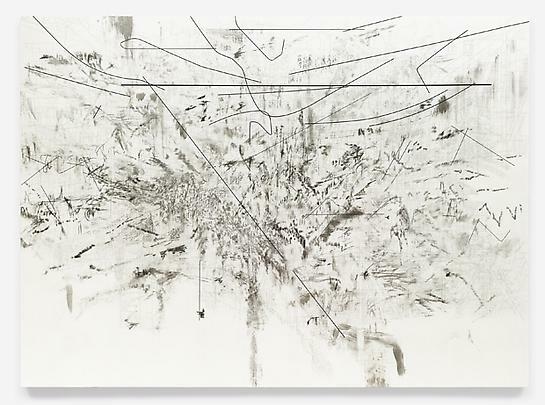 Rather, they construct what Mehretu herself calls a “third space,” a term that provocatively designates the visual relations between architecture and gesture, between representation and abstraction, a relationality that remains productively uncertain….. Mehretu’s is no neo-Futurist attempt to portray the vitalism of urban space. Instead these are visualizations that open up a third space of potentiality…. the various elements—multitudes, architectures, revolutionary histories, lines of flight—take on indeterminate relations to one another, where there is no shared or unified temporality, and similarly no predictability or final determination. Their resolution remains a future potential but present impossibility. 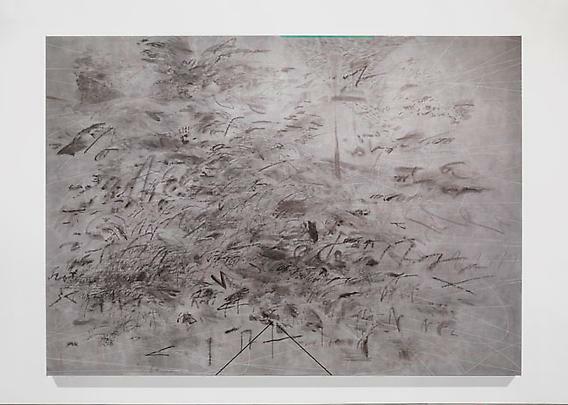 In the North Gallery, Invisible Sun (algorithm), 2012, a large canvas on a black ground, points to an emergent abstract language of mark making in Mehretu’s recent work. 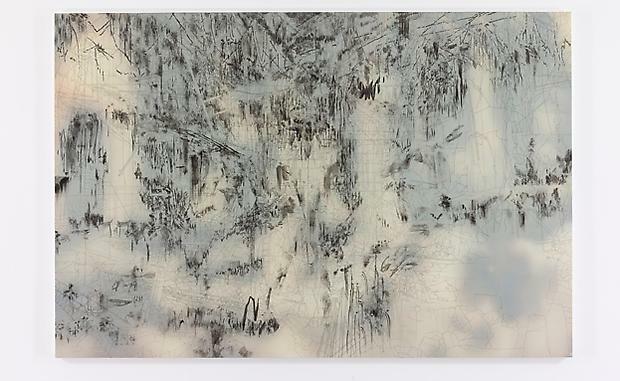 Similarly, Chimera, 2013 having evolved from, as the artist says “a place of retreat”, reveals projections of the ruins of a palace traced and then embedded in an acrylic surface with ink renderings. The Round City, Hatshepsut, 2013, contains architectural traces of Baghdad itself–its title referring to the historical name given to the city in ancient maps. 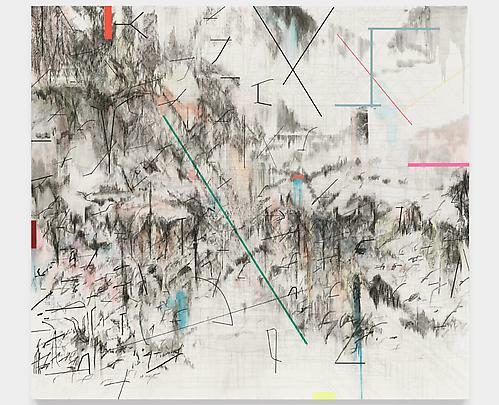 Ra 2510, 2013 juxtaposes a hybrid of ancient and futurist, its underpinnings ranging from the Gates of Babylon to modernist architecture and stadia; a panorama of clusters, points, vectors, erasure, and ink marks above. 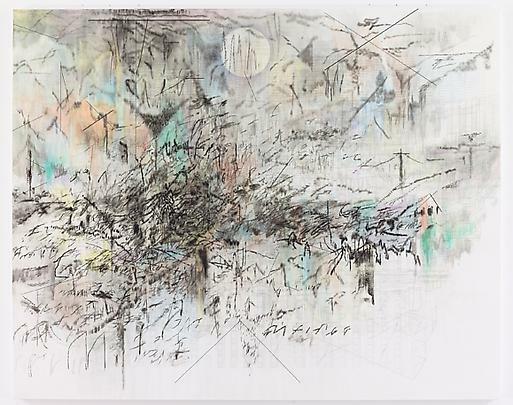 Insile, 2013 built up from a poignant photo image of Believer’s Palace amid civilian buildings, activates its surface with painterly ink gestures, blurring and effacing the ruins beneath. Fever graph (algorithm for serendipity), 2013 whose title borrows from technology’s ability to artificially intuit human behavior, invokes the refuse of the past amid an energy of emergence, presenting a white surface on which intense colors, stains, dyes are smeared and immersed into an armature of urban plans of Cairo’s Tahrir Square. Co-Evolution of the Futurhyth Machine (after Kodwo Eshun), 2013 with its vibrant color and sharp geometric lines covering layers of ink that seemingly melt downwards, contains a foundation of iconic buildings: floor patterns of mosques as part of its tracings, suggesting a persistent tension between the path of the ceremonial and the futurist. In the South Gallery, Beloved (Cairo), 2013 with its mirror-image and rotating perspective, Cairo on the right and the Nile at left, takes Tahrir Square-- site of tradition, diplomacy, and protest as its subject. Cairo, home of the Omar Makram Mosque, Zamalek, Mogamma, Heliopolis, Avenue of Martyrs, Hilton Hotel, and Egyptian Museum, with the el Tahrir Palace inverted, its iconic structures falling from the vestiges of the canvas, intersecting with voids and areas within. Concurrent with our exhibition, MOGAMMA (A Painting in Four Parts) and other recent works will be presented in a partner exhibition across the Atlantic, at White Cube Bermondsey, London. A catalogue Liminal Squared, with color reproductions and essays by TJ Demos and Tacita Dean, will be published this summer, on the occasion of the joint exhibitions at Marian Goodman Gallery and White Cube. 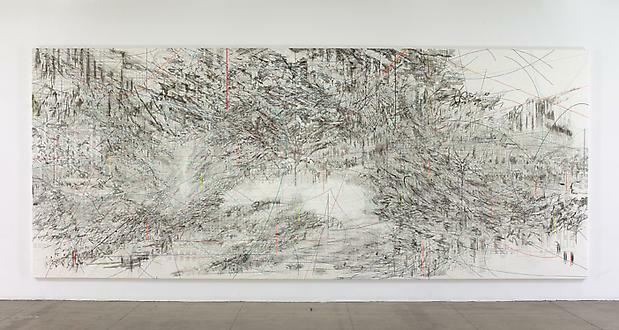 Julie Mehretu was born in 1970 in Addis Ababa, Ethiopia and raised in Michigan, USA. She studied at Kalamazoo College in Michigan (BA, 1992) and at the Université Cheikh Anta Diop in Dakar, Senegal (1990–91). She received an MFA in painting and printmaking from the Rhode Island School of Design in 1997. 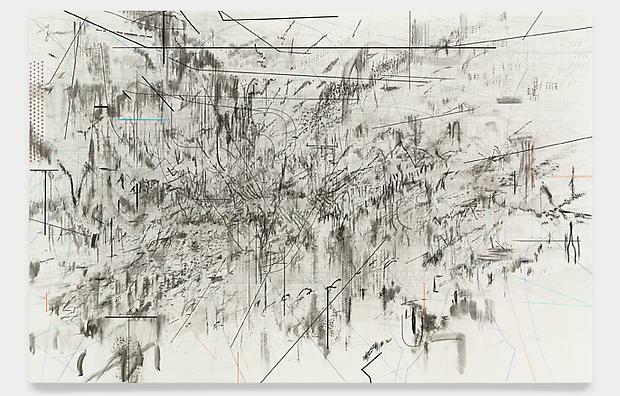 Mehretu has participated in numerous international exhibitions and biennials and has received international recognition for her work, including, in 2005, the American Art Award from the Whitney Museum of American Art, New York, and the prestigious MacArthur Fellows award. 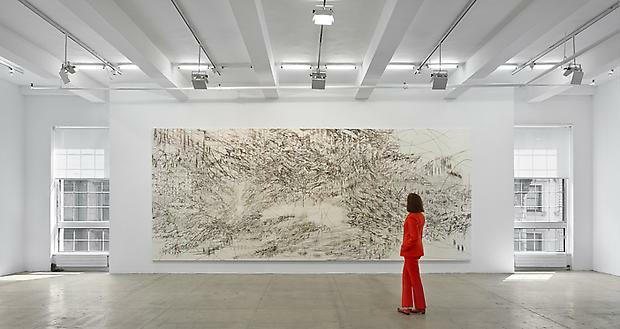 In 2009 and 2010 Mehretu exhibited a cycle of large paintings in Julie Mehretu: Grey Area at the Deutsche Guggenheim Berlin, which then travelled to the Solomon R. Guggenheim Museum in New York. Please join us at our opening reception for the artist on Saturday May 11th from 6-8 pm. For further information, please contact the Gallery at 212 977 7160. 1. 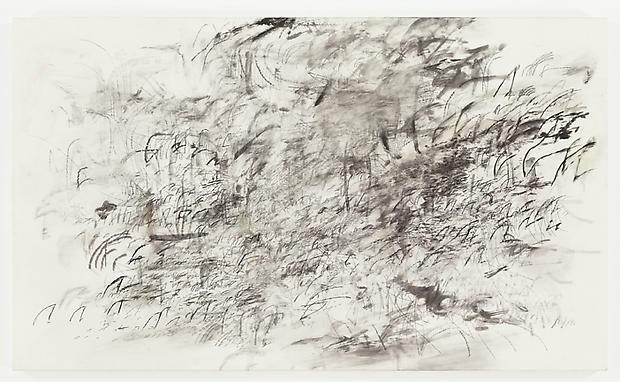 «Looking back : E-mail Interview between Julie Mehretu and Olukemi Ilesanmi» in Julie Mehretu: Drawing into Painting (Minneapolis: Walker Art Center, 2003), p. 13.